Hello Nosh Show listeners! I really want to get back in to posting reviews with Nosh Show episodes and I went a little overboard this time. I tried four different cookies the day we recorded Episode 80 and I would like to take a moment to warn you about some of them. The S'mores Chips Ahoy have that familiar flavor and texture that every similar soft chips ahoy has but the chocolate filling is a fun factor. There's no magic graham or marshmallow flavor standing out, but I didn't expect one as my expectations for this cookie were extremely low. It even smell familiar and it's surprisingly thin. I am tempted for another but there are more cookies to try. 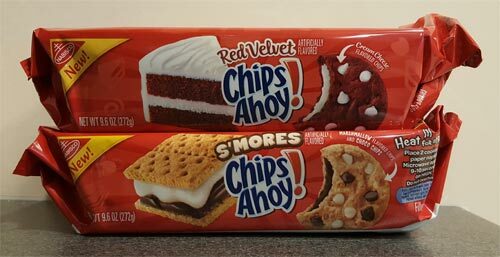 Whoa, the Red Velvet Chips Ahoy have a super potent smell (and are surprisingly tiny). I take a bite and ask myself "why did I buy these?" They taste almost... geez, I can't even describe it, but fake seems like a good word.... wait, I know, it's the coconut oil coming through. Yuck. What in the world were they thinking? The S'mores Chips Ahoy though, yeah, I made them better. The first cookie I overheated and then let cool, the second I just warmed, and it's actually the first method that gives a better result. I think the flavor just diffused a bit more but also a little crunch set in and I enjoyed that. It's still just a chips ahoy, but there is definitely a fun factor after the reheat. Disclaimer: During the show I said these were really good, but I should have said pretty good. As for the red velvet ones, well, I tried another one a few days later and still hated it. Let's try these Lemon Oreo Thins next. I expected a strong lemon aroma from the package but not so much, it was quite mellow instead. Sampling one.... and it tastes like dishwashing detergent at first but with a decent citrus aftertaste. Let's try this again. I have 1.. 2... 3 more and they do grow on you a bit. I can't say I would rush out and try these, but there is a distinctly familiar flavor akin to eating the crust of a lemon meringue pie. Overall, I definitely did not need to purchase these. Ok, so we're basically 1 for 3. Actually we are 1 for 4 if you count the Fruity Crisp Oreos I tried three weeks ago. Those things are just way too potent to truly enjoy. One or two aren't bad, but then I wind up tasting them for the rest of the day. That's not cool. Last cookie to try: Keebler Birthday Cake Fudge Stripes Cookies. I try a pair and I notice two things. One, I was not expecting the sprinkle bits to add a serious crunch factor but they do. They are quite hard and add something you've never had in a fudge stripe cookie. Two, why are these things so drying? I need to go chug a giant glass of milk now! Overall a decent cookie to mix things up a bit. Nothing groundbreaking but enjoyable if not a bit potent as you probably expected. Also, I may have let a bag of three melt in my car but rather than waste I threw them in the fridge. They became one gigantic "cool" cookie. It was an amusing snack to say the least. 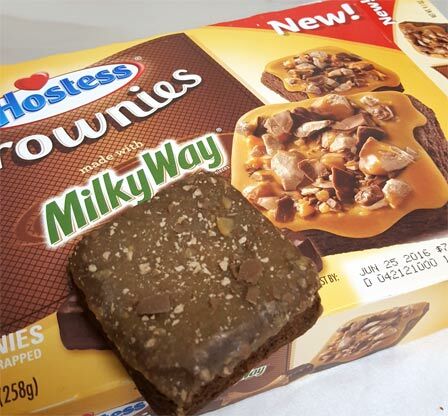 Oh geez, as I'm clearing pictures off my phone I realized that I forgot to mention those awful Hostess Milky Way Brownies on the show. It's so sad just how far off the actual product is from the marketing photo. It's their typical sweet brownie that does have a certain overly sweet caramel kick to it, but it's nothing I would ever recommend. Potent is the word yet again. I had to force myself to finish the box.